An understanding of the quantum mechanical nature of magnetism has led to the development of new magnetic materials which are used as permanent magnets, sensors, and in information storage. Behind these practical applications lie a range of fundamental ideas, including symmetry breaking, order parameters, excitations, frustration, and reduced dimensionality. Magnetism in Condensed Matter presents a logical account of these ideas, starting from basic concepts in electromagnetism and quantum mechanics. It outlines the origin of magnetic moments in atoms and how these moments can be affected by their local environment inside a crystal. The different types of interactions which can be present between magnetic moments are described. The final chapters of the book are devoted to the magnetic properties of metals, and to the complex behaviour which can occur when competing magnetic interactions are present and/or the system has a reduced dimensionality. Throughout the text, the theoretical principles are applied to real systems. There is substantial discussion of experimental techniques and current research topics. The book is copiously illustrated and contains detailed appendices, which cover the fundamental principles. 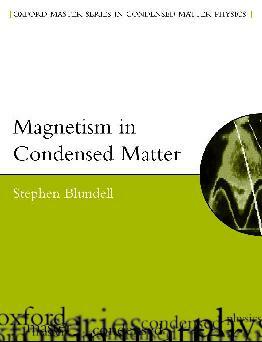 Stephen J. Blundell is a Professor of Physics at Oxford University and Professorial Fellow of Mansfield College, Oxford.